Lightly smoked foods like this Dal Makhani have a wonderful taste and this can easily be achieved at home with a very simple technique called “Dhungar” which is a quick way of smoking foods… popular in some regions of India. This age-old method of smoking can be used both during and after the cooking process and imparts a wonderful unique smokey flavour to dals, meat, rice, raita and breads or whatever else you fancy smoking… it’s my little tandoor oven! When making makhani dishes at home, infusing a final smokey flavour into the dish using this simple technique… really does make all the difference! If you have not tried this simple technique of smoking, I suggest you only smoke a small portion of your cooked dish first, taste… see if it’s a flavour that gets your own taste buds going! Experiment with timings when infusing smoke into the food, taste is personal! I like applying this technique sparingly on food, not overpowering the main flavour of the dish, this way I can appreciate it more! Use only natural lump charcoal for this method of smoking… do not use any fast lighting briquettes or any other charcoal that has chemicals added to it… trust me on this one! This site offers some reading on the subject of charcoal! Place the piece of natural lump charcoal directly on top of a gas burner. With the heat on full, burn the charcoal directly over the flames, turning the charcoal around using long tongs, so the flames reach all sides of the charcoal. The charcoal might spark a little but I have not found this to be a problem. Center the onion in the saucepan or dish (a lid is needed) containing the food ready for smoking, make sure the onion is not completely submerged in the food. Once the coal is ready use the tongs to transfer the hot coal into the center of the onion. I usual do the next part outside on my kitchen windowsill, apart from not wanting to set the fire alarm off, the smoke can leave a lingering smokey aroma in the kitchen for a day or two, which you might not want! Taking a quarter teaspoon of clarified butter or ghee (maybe mixed with some spices), drop this over the hot coal. 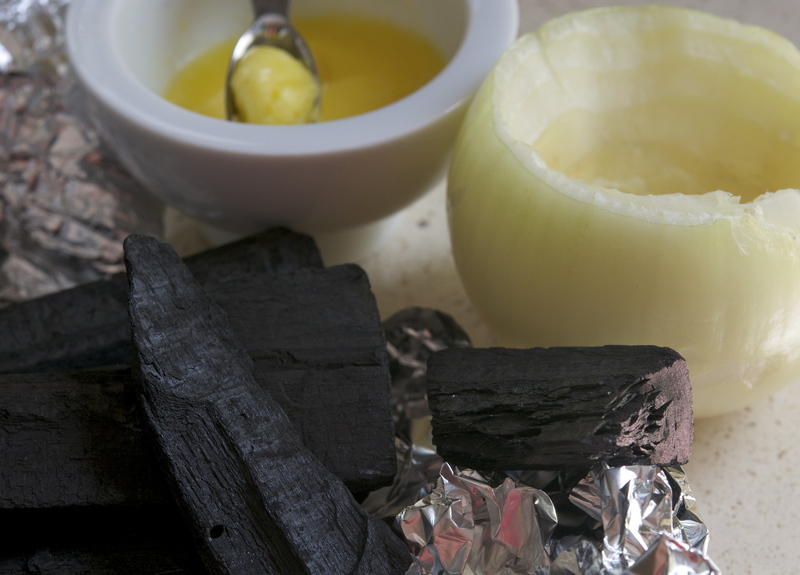 The coal will immediately start emitting a dense white smoke, have the lid ready and quickly cover the saucepan or dish. 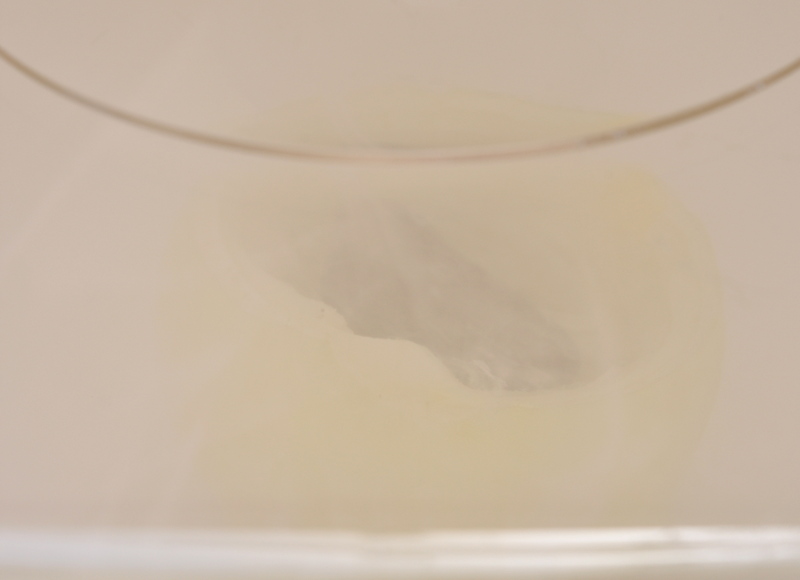 This smoke trapped inside will infuse a unique smokey flavour into what ever food has been placed into the saucepan or dish. Usually I smoke the food for about 30 seconds to a couple of minutes, depending on the recipe. 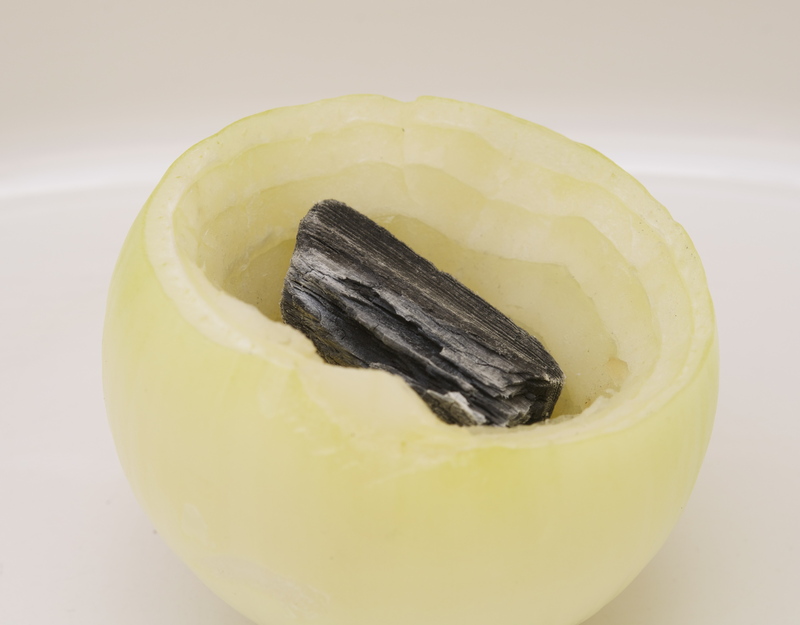 Afterwards carefully remove the onion with the hot charcoal from the food, leave to cool before discarding! Some delicious recipes using this easy smoking technique will follow! This is fabulous – what a clever idea. 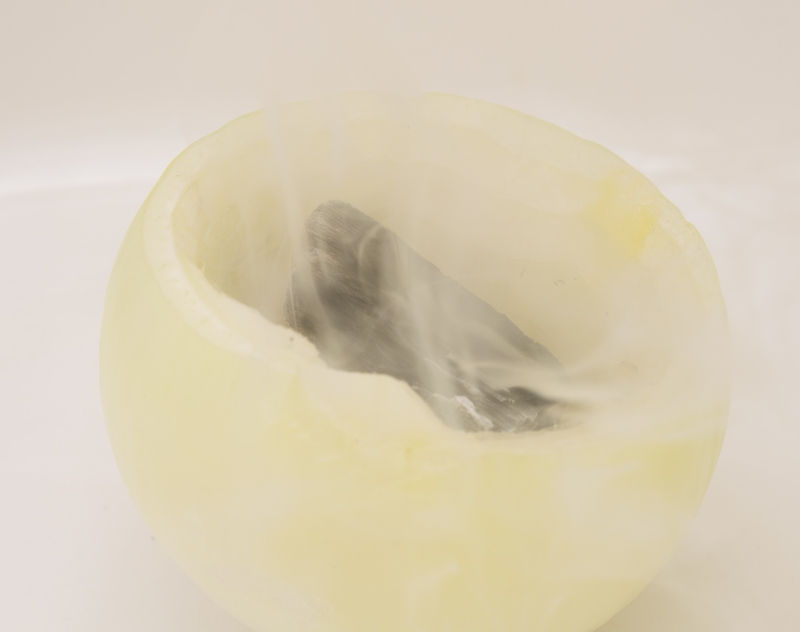 We will be trying this method of smoking – it looks a really easy way of imparting a little smoky flavour. Lovely! Love this post! Really interesting and something I will definitely have to try. What are you favourite things to smoke? 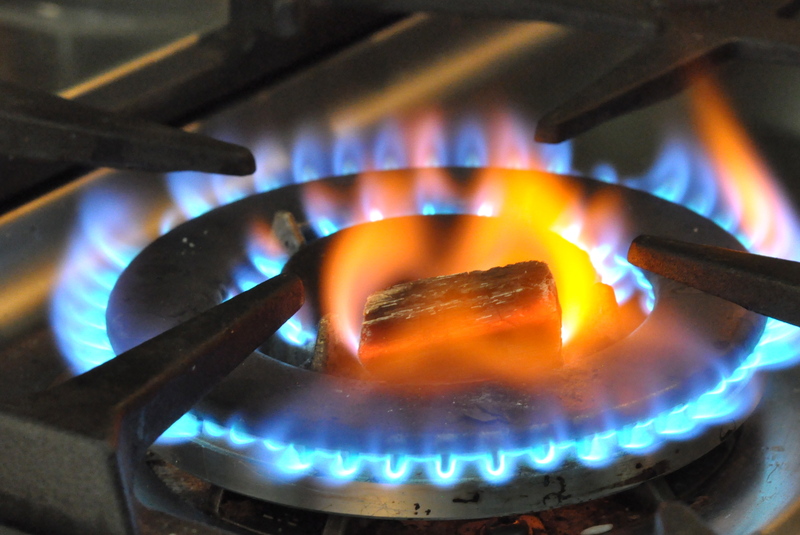 I love the photo of the coal on the stove too. Thanks for sharing this technique! I would love to read some of the recipes where you use this technique! Can you do it with fish or is it too strong? Oh good, I can’t wait. Great technique, thanks for sharing this. Will definitely try this!